“H” shaped foot assembly stabilizes the clamp in two dimensions giving superior dual-axis stability. Extra high base provides industry leading clearance from the work surface and clearance for operating crank handle. Used with standard 1/2" or 3/4" pipe (not included) with cast jaws for durability and smooth action spindle. Designed to be used ordinary 3/4" black pipe to create any clamping length for a wide range of applications. Our 3/4" Pipe Clamp features a wide base for great stability for any project, and a raised handle for clearance. 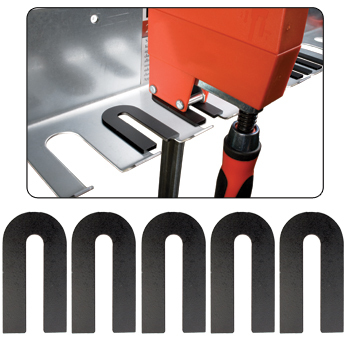 Designed to be used with ordinary 3/4" pipe to create any clamping length for a wide variety of woodworking projects. The 3/4" pipe clamp fixtures feature a wide base for even more stability than your average pipe clamp. This works especially well when gluing up larger panels. The clamp also has a spring action ratchet to make adjusting the clamping width easy and quick. This set also features 4 Sili Pads which are made from a silicone rubber material. The silicone material keeps wood glue from sticking to the pads which means you can clean the pads with warm water or you can let the wood glue dry and peel the glue right off! 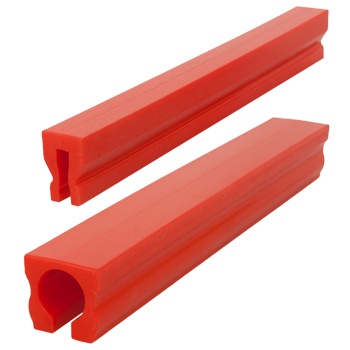 Designed to be used with ordinary 3/4" pipe to create any clamping length for a wide variety of woodworking projects. Finally a non-stick, non marring, soft pad for your pipe clamps! 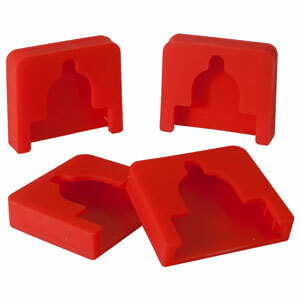 These soft rubber silicone pads fit most any pipe clamp (1/2" and ¾"). Simply slide the pads over the clamp heads and clamp up your workpieces. If any glue happens to drip on to the pads you can either clean them off with warm water or let the glue dry and simply peel the glue right off the pads. These pads are an ideal addition for every woodworkers shop. The pads are super flexible and they will not marr your project. Sili Pads are available in packs of 4. Pads are super flexible and they will not marr your project. This two-in-once clamp pads not only protect against marring, but they also double as a stable clamp stand making gluing and clamping much easier. Glue ups can be challenging enough so as it is, getting glue on the clamp bars or pipes makes it even more so. 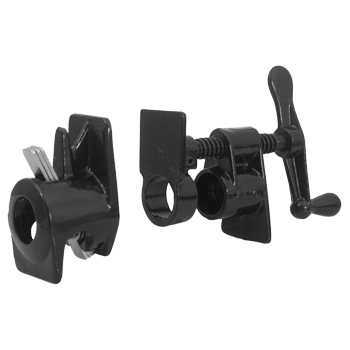 If there were something you could use to protect your bar clamps wouldn’t you want to use it? Well, the Sili Saver does just that! Simply take a Sili Saver protector and slip it on to your clamp bar or pipe and it will stay exactly where you put it. 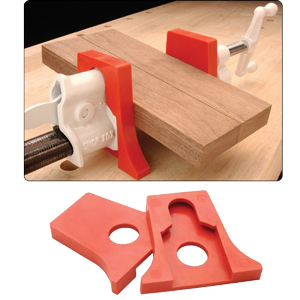 Not only does the Sili Saver protect your clamp bar or pipe, it won’t marr or damage the wood. 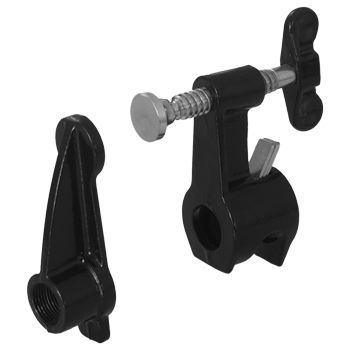 With it’s unique design, the Sili Saver will fit on most bar clamps or pipe clamps. As with the entire “Sili” product line, wood glue either washes off with warm water or you can simply let the glue dry and peel it right off of the Sili Saver protector. Each Sili Saver is approximately 12” in length and can be cut to any size needed. 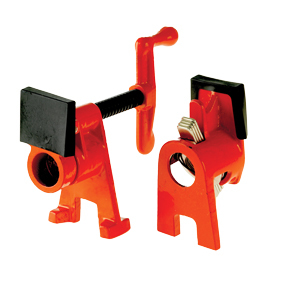 Please Note: the Sili Pipe Saver is designed to be used with 3/4” pipe clamps only. This pipe rack is specifically intended for safe storage of ten 1/2" and 3/4" pipe clamps when not in use. It is not designed to hold ,quick grip, beam style clamps or any other objects. Mount clamp rack sufficiently above floor and other objects, allowing stored clamps a minimum 2" clearance. Use 1/4" lag screw fasteners with a minimum engagement of 2" into building structure or use 1/4" bolt fasteners where back side is accessible. When placing clamp onto rack, ensure the clamp is fully engaged in the chosen slot. 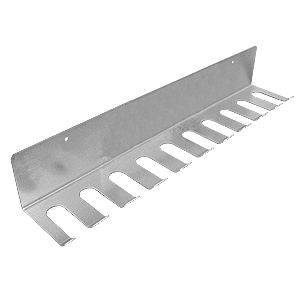 Extra heavy gauge solid steel rack with zinc plating. Note: Pipe clamps and pipe not included. The perfect accessory for your pipe clamp rack. The Clamp Rack Converter Clips fit neatly into the slots of our Peachtree Pipe Clamp Rack. This allows you to securely store your bar clamps on your Peachtree Pipe Clamp Rack with out the need for extra clamp racks. The clips are available in packs of five. Note: Bar clamps and Clamp Rack not included.